Many star clusters are beautiful sights to behold. NGC 869 and NGC 884 would have been impressive views by themselves. But together, they make quite a pair! They are so bright (from a stargazer's perspective) that they have been catalogued as "h and chi Persei", labels normally reserved for individual stars in a constellation! They are bright eonough to be visible from a dark site without binoculars. They can be enjoyed across the entire spectrum of observing instruments: from binoculars through small telescopes all the way to large amateur equipment. The view through each instrument will provide a fascinating perspective: from enjoyable widefield views through binoculars to fascinating studies of the red giants in the clusters through larger telescopes. Best of all, they can be enjoyed even from light-polluted cities! They were first catalogued by the Greek astronomer Hipparchus, which might be why they are not listed in Messier's famous list. They are over 7,000 light-years away, but only a few hundred light-years apart from each other. They are both composed of stars younger and hotter than our sun. Interestingly, the stars of both clusters are similar in age - hinting that they were formed from the same star-formning region. These depictions of the clusters also highlight a visitor: a comet! This is Comet 103P/Hartley, informally called Comet Hartley 2. 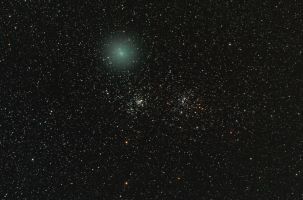 Early in the morning of October 8, 2010 local time, the comet passed close to (from our point of view) the Double Cluster. This comet is a frequent visitor to our domain, orbiting the sun every 6-1/2 years. It had a particularly favorable visit this time around, coming to within 11 million miles of the Earth in 2010, making it reasonably visible to astronomers. What's even more interesting about this apparition of Comet Hartley is that it was also visited by a space probe, which took some really cool close-ups of the comet on November 4, 2010. 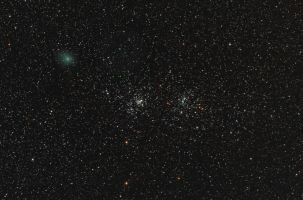 I took two images of the Double Cluster with Comet Hartley: one at around 9:30PM EDT the evening of October 7, and another at 3:30AM EDT the morning of October 8, when it passed the closest to the Double Cluster from my perspective. Both images are displayed here. I may have overbrightened the October 8 depiction of the comet, which is why it appears so much brighter in that picture vs. the October 7 picture (where the comet is also further from the cluster). 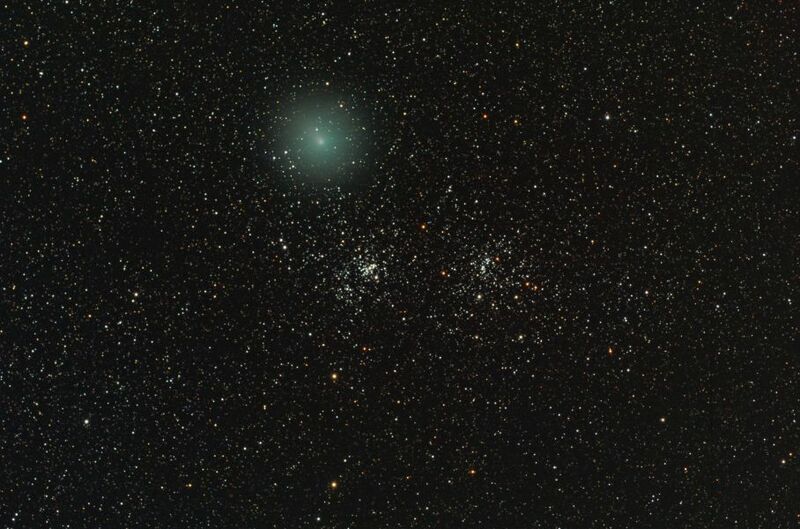 One more point about the Double Cluster: though they lie within the boundaries of the constellation Perseus, the stars of Cassiopeia are actually a better guide to finding the clusters. At least they are to me! Another point of interest: shooting this rare conjunction is what inspired me to image IC 1848. Equipment Used: Takahashi FSQ-106N on a Takahashi EM200 Temma-PC mount. SBIG STL-6303 camera with 8-position filter wheel and Astrodon filters. Images were taken unguided.